My boyfriend got me an Instant Pot for Christmas this year. And when it shows up on your porch with a picture of what's in the box on the side and he's not fast enough to get to the door before you, you get to open your Christmas present early. Naturally, I had to try it out within seconds of pulling it out of the box - and decided to make French onion soup for the inaugural run of my brand new Instant Pot! Instant Pots are just well-branded pressure-cookers with preset ways to "instantly" cook meals. While the name itself is a little misleading, Instant Pots do what pressure cookers do best: reduce the cooking time of just about everything by about 70%-80%. 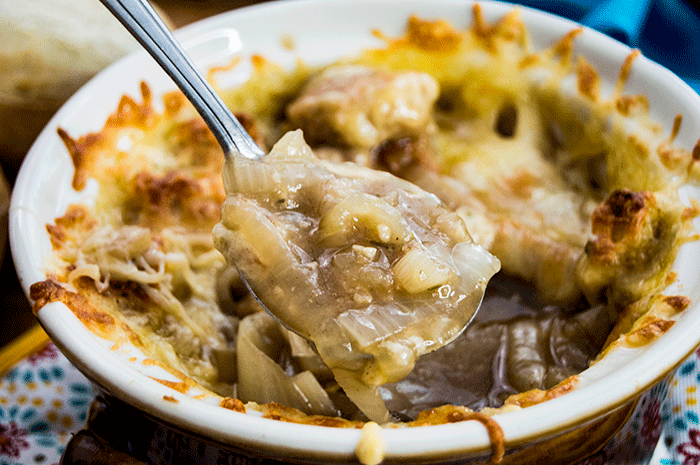 For French onion soup, the onions first have to be sauteed for about 10-15 minutes until they are tender and just beginning to caramelize. 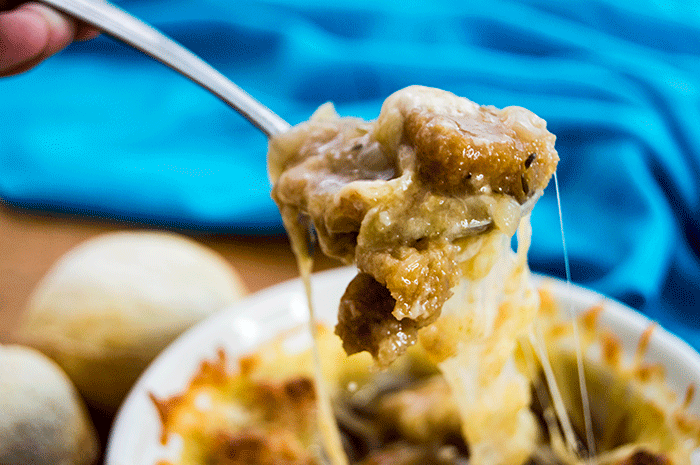 Traditional French onion soup might saute the onions for hours before cooking them into soup. The Instant Pot on saute mode gets the job halfway there in about a quarter of the time. The Instant Pot method results in a delicious soup with well developed flavors in about 8 minutes. The high pressure tenderizes the onions and because there's no stirring, they don't break down or start to become mushy. There are a few ways to depressurize the Instant Pot - you can let it depressurize naturally over the course of about fifteen minutes; quick cook on "vent" mode; or do a quick depressurization by toggling the valve from "sealing" to "vent." This will release a blast of hot steam, so BE VERY VERY CAREFUL and wear a cooking mitt so the hot steam doesn't burn you. When the soup is done in the Instant Pot, the next step is to fill crocks full of the soup and then top generously with cheeses like gruyere, mozzarella, or gouda. Broil the crocks of soup until the cheese is bubbling and beginning to brown. Garnish with a pinch of fresh thyme and serve right away, with a caution that the bowls will be VERY HOT. My boyfriend actually called this soup "absolutely perfect," which is a high compliment considering I spoil him and his standards are now very high. But I have to agree with him - the Instant Pot was easily able to produce restaurant quality French onion soup. Turn the Instant Pot (IP) onto "saute" mode then press the "+" to change the setting to "more." After 10 seconds, the IP will say "On". Set the timer for 15 minutes. Add the olive oil and butter to the IP and let melt almost completely before adding the sliced onions. Stir the onions so they are coated in the butter. Saute for about 10 minutes, stirring occasionally until the onions are tender and starting to brown, or until the timer is done. Stir in the garlic, flour, sea salt and brown sugar. Pour in the balsamic vinegar and Worcestershire sauce and stir until combined. Pour in the beef broth and fresh herbs. Make sure the IP isn't more than 2/3rds full. Add the bay leaves. Set the IP to "high pressure" mode. Place the lid on the IP until it locks and the melody plays. Set the valve to "sealing," Set the IP timer for 8 minutes. Preheat the broiler. Let the IP depressurize naturally over about 15 minutes OR do a quick depressurization by CAREFULLY releasing the "sealing" valve to "venting" - wear protective over mitts to not get burned by the spatter or steam that will come out when the valve is released. Ladle the soup into individual crocks. Generously top the soup with croutons and then the shredded cheeses. Broil for 5-8 minutes, or until the cheese is melted and browning. Let rest for about 5 minutes before transferring to a serving plate with slices of crusty French bread. Enjoy!